BelarusDigest > All > Belarusian Machine Building: Once a Nation’s Pride, Now a Burden? Network of gas stations switches service to Belarusian language thanks to MovaNanova. ODB publishes 2014 annual report. Belarus Research Council announces call for concept papers for policy-oriented original research. CSOs contribute to government discussion of 2030 Concept of National Development. Government of Belarus says its finally ready to adopt a separate law on domestic violence and to sign the UN Convention on the Rights of Persons with Disabilities. Network of A-100 gas stations switches to the Belarusian language. From January 1, all operators of the private company of gas stations are advised to talk with customers in Belarusian; within a month all messages and labels will be replaced accordingly. The company emphasizes that the transition to the Belarusian has happened in close cooperation with the courses MovaNanova/ Language in a New Way. Office for Democratic Belarus (Brussels) presents the results of 2014 – significant events in photos, media, and articles. The Office has collected materials to present the most interesting results of its work in 2014 – in particular, the 2nd European Intercultural Festival, Clearing House initiative, sectoral discussions and meetings with representatives of NGOs and local authorities, expert meetings in the field of higher education and energy, public lectures and other events. 'Contemporary History in Faces' in Vilnius. The Barys Zvozskau Belarusian Human Rights House invites to the presentation of the book of the Belarusian journalist Aliaksandr Tamkovich ‘Contemporary History in Faces’. The book tells the stories of 70 the most outstanding people known in Belarus and beyond who over the past 15-20 years have been directly involved into the recent Belarusian history. The presentation will be held on January 14, at 3 pm, in the Belarusian Human Rights House in Vilnius. Belarus Research Council is announcing a call for concept papers for policy-oriented original research that focuses primarily on actionable policy recommendations. The call is open for Belarusian think tanks and NGOs that intend to conduct their policy-oriented original research in Belarus focusing on solutions – policy, legislative or other related. The deadline for submission is February 1, 2015. Local governments: 15 years online. For two years Legal Transformation Center Lawtrend monitors the information on the official websites of Belarus’ state bodies. The recent monitoring covers 135 official website in regions and Minsk. One of the basic conclusions is that the functionality and content of websites of local governments do not correspond to any legal requirements or expert expectations. Readiness of the Belarusian higher education to join the EHEA: Alternative Report 2014. In December, an alternative report on the readiness of the Belarusian higher education to join the Bologna Process was sent to the Secretariat of the European Higher Education Area (EHEA). The report was prepared by the Public Bologna Committee and submitted on behalf of the Belarusian National Platform. 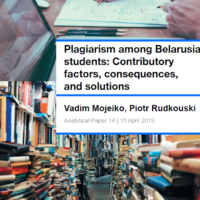 The key report conclusion is that despite of certain steps toward reforms, the Belarus' higher education system still does not meet the requirements to join the Bologna Process. 'Belarusian Renaissance in Homel' edition. Homel branch of Belarusian Language Society released a brochure that tells about the history of the civil society development in Gomel region in the late 1980s – mid 2000s. The brochure contains several dozen interviews and unique photos. Gender course for young Belarusian activists. Forum SYD and IRI invite to participate in a training course for young female Belarusian activists who are interested in gender issues and have the experience of participating in non-governmental organization or political party. The course duration is 5 months. Deadline for applications is January 20, 2015. Ihar Lohvinau fined of $70 thousand. On January 9, the owner of the private Minsk bookshop Ihar Lohvinau stood trial where he was accused of selling books without the license of the Ministry of Information. The court supported the tax inspectors’ position and fined Lohvinau for over Br961 million (about $70 thousand). Lohvinau notes that the court decision means bankruptcy for the store. Alena Tankachova’s trial to continue in Minsk on January 12. Human rights defender Alena Tankachova is standing trial in Minsk trying to appeal the decision to deport her from Belarus for three years for speeding. Alena Tankachova is a Russian citizen who has lived in Belarus for 30 years. She has a job and her own accommodation here. The next hearing will be on January 12. TSEKH didn't manage to prolong lease. A Creative space TSEKH did not managed to prolong the lease of premises at Independence Avenue, which is owned to a commercial bank. The TSEKH worked for 1.5 year and became a shelter for dozens projects and exhibitions. The TSEKH director, Yulia Darashkevich doesn’t link the incident with political pressure as soon as the TSEKH has never collaborated with political organizations. The bank-owner refused to explain the reason for the eviction. Massive blocking of websites in December. Since December 19, several informational Internet resources in Belarus were subject to blocking. In particular, users’ access to belapan.com and belapan.by, naviny.by, belaruspartisan.org,charter97.org, udf.by, 21.by, gazetaby.com, zautra.by have been restricted without explanations. Belarusian Association of Journalists considered that the blocking of socio-political websites was a complete breakdown of law and order. Belarus develops a separate law to combat domestic violence. Vice Prime Minister orders police and Labor & Social Protection Ministry to prepare a concept of the Domestic Violence law by May 2015. Belarus is one of the last European countries where there is still no specific law against domestic violence. In 2013 an expert group within the network of CSOs to prevent domestic violence drafted a relevant bill that wasn't interested for the state bodies then. Belarus will sign the UN Convention on the Rights of Persons with Disabilities soon, according to Alyaksandr Rumak, deputy minister of labor and social security. Belarus is one of the few European countries that have not joined the international treaty so far, adopted by the UN General Assembly in December 2006. Belarusian CSOs strongly advocate for joining the Convention, namely, the Office for the Rights of People with Disabilities is implementing the Sign with Heart campaign to collect signatures of organizations and concerned persons under the relevant public Memorandum. CSOs contributed to the 2030 National concept. During three weeks of public consultations (November-December 2014) the Belarus Ministry of Economy received 22 letters on the draft National Strategy for Sustainable Socio-Economic Development for the period up to 2030. In particular, the Ministry publicly expresses its gratitude to a number of CSOs – SYMPA, Liberal Club, Legal Transformation Centre, Green Alliance, Minsk Bicycle Society, etc.